One of my favorite things about my daughter is that she is so animated. She enjoys hearing and telling stories, but most of all acting them out. She loves to take a story further than just words. As a lover of reading and books, this makes me incredibly excited! It provides an easy way for us to spend time together – crafting and playing with our creations! The last round of books that we read, and in turn acted out, was about farm animals. 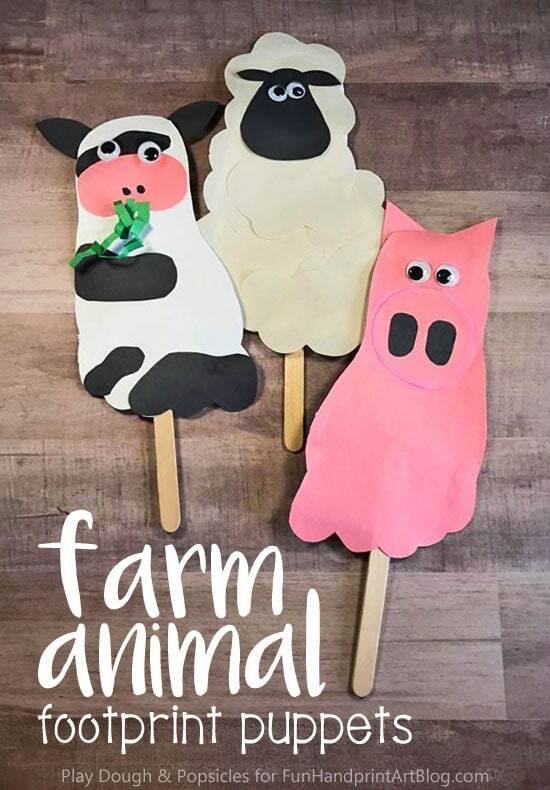 To enhance the reading experience, we first made these adorable farm animal footprint puppets. 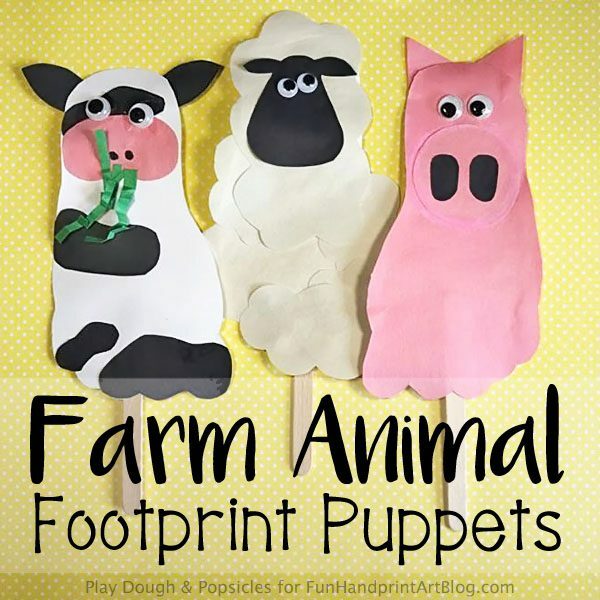 Read on to see how we made the footprint cow, sheep, and pig puppets! The purpose of the farm animal theme was because we had just spent the day at our state fair. We saw animals of all different shapes and sizes. Some where loud and some were downright sleeping. We have another fair coming up in a month or so too, in our county. I thought it would be fun to read farm books before we went so that she could have a little more knowledge of each animal when she saw them. And of course we had to make puppets to go along with our books! *Amanda and I are both blog partners for CraftProjectIdeas.com – an awesome resource for craft supplies! We recieve their products to use in our crafts and share with all of you. You can find many of the supplies needed for this post at Walmart in the craft section. Just look for Horizon Group on the packaging. Everything is super affordable! You can see all they have to offer by visiting their website here. We started by tracing my daughter’s foot onto a piece of cardstock. After cutting out the footprint template, we used this as the template for the three bodies. We traced and cut one out of pink and two out of white construction paper. Now we were ready to turn them into cute farm animal footprint puppets! We started with the cow. 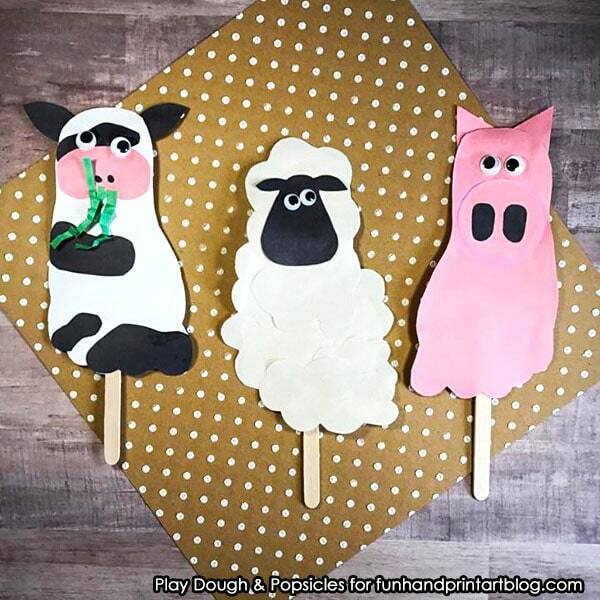 To make it, cut out the spots and ears from black construction paper. Then cut an oval for the snout out of pink paper. My daughter thought it would be fun for the cow to be eating grass (so cute! ), so we also cute a few small strips from the green construction paper. Then just crinkle it a little. Once the pieces are cut, glue everything in place. 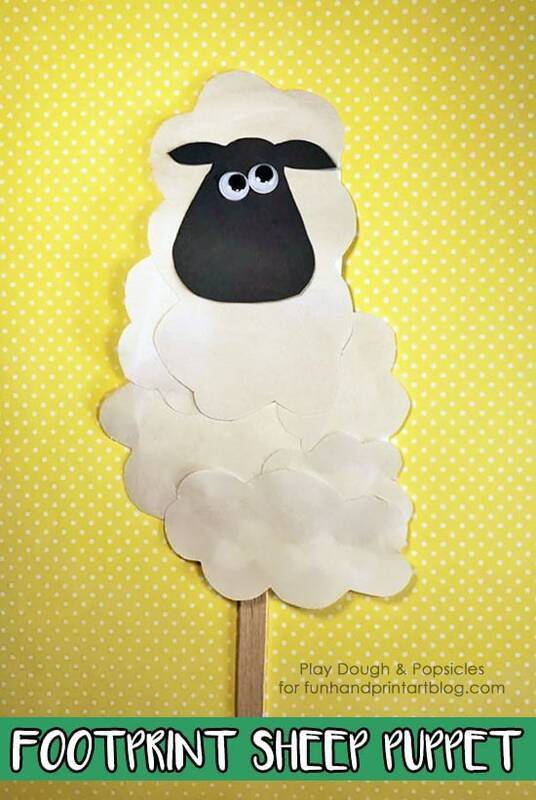 The sheep was simple because it’s just like cutting out puffy clouds. Cut out a handful of ‘clouds’ and then glue them on until the footprint is covered. The face is made from black construction paper. Glue it in place and set aside to dry. You might like this adorable Foam Duck Handprint Craft. Finally was the pig. This was even more simple because it was literally just adding a face. I told my daughter some pigs are brown or have spots, but she wanted a cute little pink pig, just like BABE. 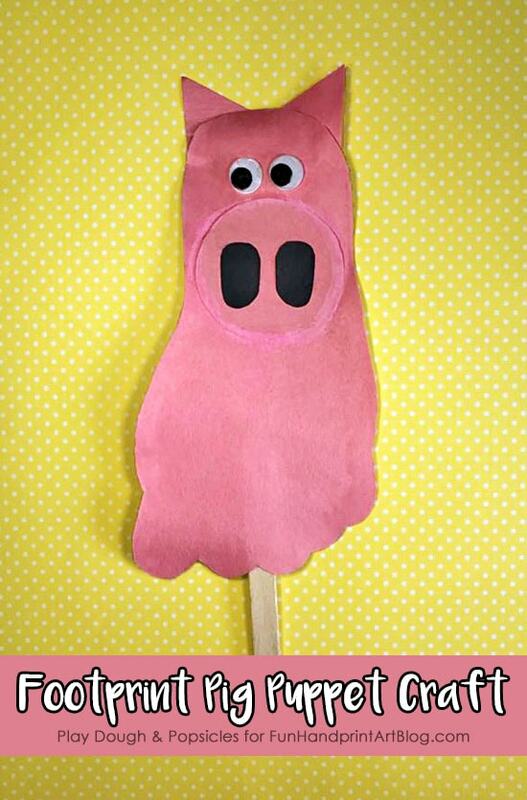 She cut out triangles for the ears and the oval for the snout. I cut ovals out of black for the snout as well, but you could make fingerprints instead if you wanted. Since the pink on pink didn’t add too much dimension, we used a little pink paint and put a ring around the nose. This is not necessary, but she wanted to so we did it. Once the animals’ bodies and faces ware dry, it’s time to add wiggly eyes to all of them. 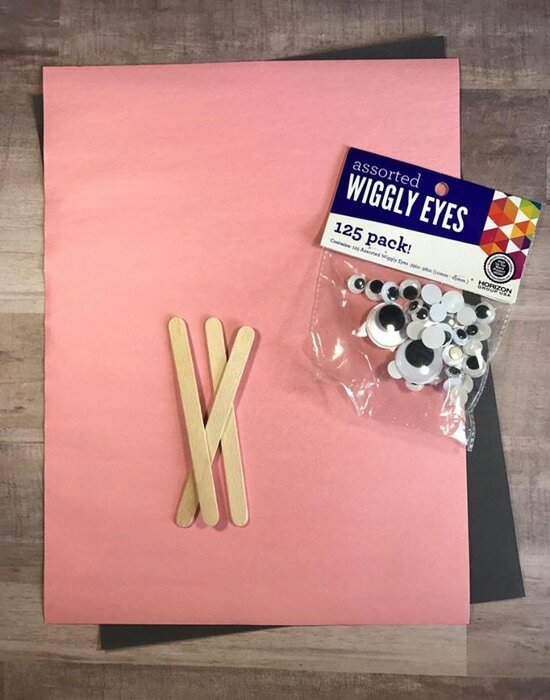 I love using googly/wiggly eyes because you can make the creations look funny, sad, happy, or funky all by the direction the eyes are going in. 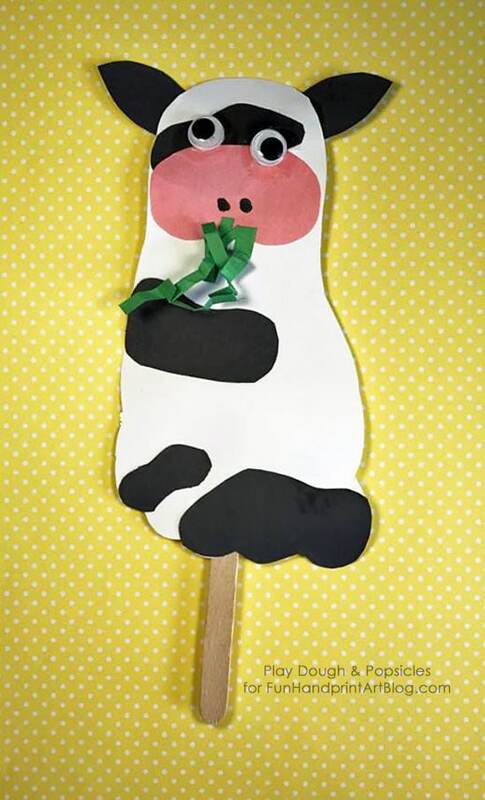 To finish your farm animal puppets, glue a craft stick onto the back of each. These can be taped on if necessary or wood glue works well for crafts like this.